I scream, you scream, we all scream for Mainstream! Yesterday I received a letter announcing Grayson’s school session and teacher along with a school supply list. I’m sure countless other families in the district received a similar letter in the mail. Our letter felt like SO MUCH MORE than a teacher assignment and a supply list. Our letter felt like a prize. A reward for our efforts. The proverbial light at the end of the tunnel. Although in reality I suppose it is more like a flashlight at the beginning of the tunnel. But heck, light is light and I will take it! Because over the past two years we have spent a lot of time in the dark. We have logged a lot of hours listening and asking questions and making plans. Sometimes things felt so much bigger than us; so we just blindly followed where the path led. And this particular path is leading Grayson to mainstream 4K in our home school district! When we first received Grayson’s diagnosis I looked at everything in way too big of a scope. I looked at my 2 year old and my head skipped ahead to high school and college and marriage. I worried about how the diagnosis would impact his ability to live a full life. I worried until I realized that I had to make my scope much smaller. I had to look at Grayson in the moment. I had to set realistic and attainable goals. Short-term goals. I had to understand what I really wanted for him, and then we had to make the best plan we could to get him there. I threw myself 100% into his care plan. I remember describing this to a friend saying that it felt like the most important recipe that I would ever create. I had to pick just the right amounts of “this” and just the exact amount of “that”. And because it felt so important I labored over the many decisions. Just 2 short months after the diagnosis we had our first IEP meeting. Grayson was not even 3 years old at the time. And as I sat in that room surrounded by strangers I did my best to take in all of the information and recommendations that they shared. In case you have never been in an IEP meeting before, let me set the scene. There were 6 people around the table in addition to myself and my husband. The 6people consisted of (1) Birth to 3 representative (1) School District Special Ed Coordinator (1) Speech Therapist (1) OT, (2) Classroom Teachers. I listened to these complete strangers tell me exactly where my child should go and exactly what he should do. It was such a surreal out of body experience. At that very first IEP meeting the team recommended that Grayson spend his 3K year in a school in our community focused on providing special education services to students in the district. During the time of the diagnosis my husband and I toured this school. We walked around the school and absorbed the environment. We marveled at the swimming pool, Grayson loves to swim. We explored the sensory room. We met the teachers and interacted with the students. And as we sank into our seats in our car we both let out a big exhale. You see, the school was great. But, we both just had a gut feeling that the school was not the best environment for our son. Not then. Maybe not ever. Grayson spent his 2 year old year at the Lake Geneva Montessori School. I just cannot say enough amazing things about this school! At the time we enrolled Grayson we did not have a diagnosis. In fact, we did not receive Grayson’s diagnosis until he was 2 months shy of finishing the school year. The school and the teachers embraced Grayson with open minds and pure love in their hearts. We all knew early on that something was different about Grayson. They took the time to schedule extra meetings with me. They filled me in on his progress. They did not hesitate to call and let us know if things just were not “on track” that day. And when they did that we picked him up and knew that we could start fresh the next day. When we went to Iowa for our diagnostic testing we told them that Grayson attended Montessori school. There first reaction was a noticeably surprised “oh really?” They went on to explain to us that children on the spectrum can struggle in a Montessori environment. This surprised me because everything I had ever learned throughout my education taught me that Montessori was by definition an approach to help children with varying needs explore at their own pace. The Montessori environment allows children to engage in their own activities (or “works”). The activity selection and pace is up to each individual child. They can perform the work individually or in a group. There is a structured group component of the day as well, but the guiding principles are focused on letting the child work within their own natural development. Some people believe that children on the spectrum may not have enough innate social development to thrive in an environment that does inforce a firm social structure. This was not our experience. We found this environment to comforting for Grayson. We also found him learning to read and respect the boundaries of the social development of other children. For a child on the spectrum, this is incredibly difficult. As part of our diagnostic process the therapist asked to speak with Grayson’s Montessori teacher. After returning from the phone call she said “wow, I totally get why that environment works for him.” You see, there was something so nurturing and so individualistic about their approach with Grayson. And in a classroom of only 8 children and 2 teachers; Grayson had a lot of attention. And sometimes he requires a lot of attention. Up until the diagnosis, and then up until the IEP meeting, it was always our intention to send Gray back to Montessori for his 3 year old year. And even though we understood all of the reasons to send him to the special education school; we had our own reasons to keep him at Montessori. The environment was familiar to him. Many of his peers would move on to the 3 year old room. He knew the building and the classroom. The rules were familiar to him. Grayson had already learned the rules, the schedule and the structure at Montessori. At a time when so many things were changing for him; it was hard to wrap our heads around more changes. The school had become a comfort zone for James and I. We trusted the teachers. We valued their efforts to communicate with us. He was thriving in the environment. Being around typical peers was helping Grayson progress in his speech and social development. We really worried about Gray’s regression or failure to continuing progressing in an environment without typical peers. In an oddly selfish way, our friends were at this school. It had become a part of our social identify as parents. And the idea of making another change, retreating in another way, seemed scary. In the end, we kept Grayson at the Montessori school for his 3 year old year. It was a decision that felt right from the beginning. And after weeks of talking and back and forth we decided to listen to our instincts. And, Grayson had an amazing year. He grew and changed and progressed in so many ways. He learned social ques and norms from watching the 22 typical aged peers in his classroom. He embraced rules and structure that were new to him. He found ways to communicate his needs and wants within the classroom. As we sat back and watched his progress in awe, the time to yet again make a decision about Grayson’s future loomed over us. For Grayson’s 4 year old year we would have 3 choices (1) continue at the Montessori school (2) Mainstream School or (3) special education school. Again we listened to the recommendations on our team. However, this time our team was divided in terms of what exactly was the best environment for Gray. There were so many reasons for us to stay at the Montessori school. In the end we choose to prepare Grayson to enter Mainstream 4K. One of the biggest deciding factors for us was the speech and OT services. Right now so many of Grayson’s services happen in the house. And the ability to receive these services in the school environment meant more time at home just being a kid. Another big deciding factor was that Rowan will be at the Montessori school next year. My Grayson is a creature of habit, and we had too many questions about how Rowan’s presence would impact Grayson’s focus (or lack thereof). Lastly, we hoped that Grayson could benefit socially from starting 4K with all of the other children who would move throughout the grades with him in our school district. Grayson’s goodbye to the Montessori school was sad for all of us. He grew there. He changed there. He went there as a two year old struggling to find his voice; and he left as a 4 year old with so much to say. I went there as a scared and confused parent, and left with answers, a diagnosis and a plan. I am so grateful for the Montessori environment. I am thankful for Grayson’s amazing teachers and aids over our 2 years there. I can say whole heartedly that without it, without them, I am not sure that I would be holding this Mainstream 4K shopping list in my hands. This next year will be another year of many firsts for Grayson and for our family. But we will face them like we have faced every other first we’ve met along this journey; face on, full of hope and ready to move mountains! My son Rowan is one of the happiest kids that I have ever met. He loves to sing and dance and run and climb. He likes to throw balls and he likes to twirl. He likes to watch movies about trucks and cars and he likes to watch movies about princesses. Sometimes he likes to roar like a lion, and other times he likes to flap his arms and pretend that he is a pretty peacock. When he sees me get ready in the morning sometimes he likes to play with my make-up brushes on his face. Other times he likes to throw my hair ties in the toilet and giggle. At times he likes to run around in only a diaper. Other times he is happy in his ruggedly handsome “boy” clothes. And sometimes he likes to take my scarves and shirts and wear them around his neck. He refers to these as a “beautiful dress.” You see, Rowan likes all kinds of things. And I LOVE that about him. I love that he finds ways to express himself. I love that he does not feel bound to like one particular thing or do things one particular way. He marches to the beat of his own drum. He is clumsy and silly and full of spit fire. Just when we think we have him figured out; he reminds us that he is full of surprises. Rowan is a very emotional child. And I have NO CLUE where he gets that from (ok, I’m kidding…he may possibly get that from me. A little. Maybe.) It is very important to Rowan that people listen to him and include him in things. It is very important to him that you ask him questions if you are asking other people. It is very important to him that you acknowledge him and offer praise. If we forget to praise him he will say “good job Rowan” to himself. I love this about him. I love that he is proud of himself. I love that he wants the positive feedback. And I know that part of this is because Rowan is Rowan. And I know that part of this is because Rowan is the brother of someone with ASD. I know that too many times a day I have to distract myself from Rowan to address a need or behavior of Grayson’s. I know that sometimes we pacify Rowan longer than we would like with an iPad or a coloring book so that we can fix a problem that Grayson is having. I know that many times in a day Rowan has to “trade” with his brother because Grayson wanted the yellow plate. I know that at the end of the day Rowan is always left with the brown tootsie pop or the slightly broken cookie. I know all of these things. And these are the things that swirl in my head as I lay in bed at night. I think about all of the compromises Rowan makes for his brother. I think about the patience and understanding and compassion that this little two-year-old has already learned. I think about his adaptability. I am proud of his adaptability. I hope that he can teach his friends at school to be just like him. I hope that having a brother with ASD makes Rowan better. A better brother, a better friend, a better person. Because there are a lot of times that having a brother with ASD may make someone feel invisible; not my Rowan. Rowan will make himself seen. He will make his presence known. He will twirl into the middle of the room and he will hold his brother’s hand while he is sad. He will be wiser beyond his year. And because he is all of these things…I just simply do not care if he wants to wear princess underwear. I do not want to launch a huge gender debate. In a changing time where we openly talk about “gender fluidity” I think it important for parents to understand their role in their children’s gender identity. Actually, I would like to see parents take less of a role. Let your kids be kids. Without rules. Without introducing your own ideas about what they should or should not wear. What they should or should not play with. Let your children do the things that make them happy. Teach them to be good and kind humans. Take away the negativity and stigmatism about things that are different. Create a life of openness for your children. Encourage them to express themselves. And then do not back away or balk at them when they do. I am raising two very different children. I know that Grayson is Grayson and Rowan is Rowan. They have different interests, different tendencies, and different instincts. They like many of the same things, but sometimes in different ways. They play with many of the same things, but sometimes in different ways. They explore many of the same things, but sometimes in different ways. And we let them do this. In our house sometimes things are not always conventional. The people who come into our house embrace the uniqueness of our boys. All of Grayson’s therapists know that Rowan love to wear my scarves as dresses and they always tell him that his dress is beautiful. They are not worried about Rowan behaving “too much” like a girl. They only care that he is happy. Why? Because that is the environment we have created in our house. This weekend Rowan hit a home run in the potty training department and it was time to purchase underwear. I went to the store in hope that maybe, just maybe, the world had evolved enough that I could find some of the more popular female Disney characters in the boy section of the store. After all, many of these Disney movies include a prince counterpart. And what is more manly than a rugged beastly man and the superhot princess he just landed himself? I was sadly mistaken. The girl’s area for underpants was about 3 shelves long, while the boy area was only half of shelf. Girls could choose from a number of different Disney packs, female super heroes, girl Nickelodeon characters, days of the week underwear, etc. The options were pretty much endless. Boys could choose from much lesser known male Disney characters, Mickey Mouse, Paw Patrol and male Super heroes. As I perused the aisle it made me mad that boys and girls did not have all of the same options available to them in their section. I had absolutely no problem grabbing one of the girl Disney princess packs for my son. I went to the store to purchase underwear that Rowan would like. And I could literally give zero shits about the color or content. When I got home we pulled all of the underwear out…Spiderman, Nemo, Buzz Lightyear, Rapunzel, Cinderella, Ariel, Mickey, etc. He was so excited about each and every pair. They were all so different. The Mickey pairs were very bright primary colors. The Nemo pairs had a huge giant fish across the entire back. The princess pairs were colorful and swirly. I asked Rowan to pick his favorite and he said “Spiderman”. I asked him again and he said “Nemo.” I asked him again and he said “Rapunzel.”. He loved them all. Just as I knew he would. Yes, my 2 year old son likes to wear dresses and sing princess songs and he sleeps with two dolls. And he is one of the sweetest, happiest, most intelligent two year olds I know. He loves what he loves; and I love that about him. I am tolerant of a lot of things. And the reason is simple…demonstrating tolerance teaches tolerance. Let us all take the time to demonstrate tolerance to all things in our lives. And in turn let us all learn to be more tolerant of all things. Yes, my son has princess underwear. And if that bothers you…I don’t really care. So much of what I write here is about our family. About autism and how we navigate that part of our life. And sometimes that piece feels so big that I am thankful for my strength. I am proud of that strength. That strength is earned. It comes from the choices and decisions that brought me here. That led me to my husband. To my children. To my life. Some of you may not know that I was married once before. I got married so young. Before I knew who I was. Before I knew what I wanted. I tried to be half of something else before I was whole on my own. When I left that relationship I called into question a lot about myself. Why I made the decision I did. Why I choose something that was not good for me. Why I could not make it work. Why I gave up. Why I started over. I spent more time than I was comfortable with thinking about that relationship. Learning from it. Vowing to be different. To be better. It is a part of my life that I keep close to me. I did not put it on shelf and file it away. I keep it close because it was a part of my journey. It changed me. I was broken; and then I healed. Remembering that helps me remember that I can survive anything. It helps me remember that my strength comes from within. From my experiences. From my life. And somehow, remembering that seems to enhance my strength. I think we all feel broken at some point. Falling down is a part of life. It is what teaches how to stand back up; bruised but not ever truly broken. 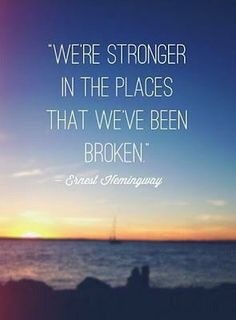 Earnest Hemingway said that “we’re stronger in the places that we’ve been broken.” And I know this is true. I know that this is true because I have been broken. I have fallen down. I have made mistakes. I have been weaker than I wanted to be. I have questioned myself. Questioned my strength. Questioned my ability to heal myself. And, like anyone who has felt broken before understands; one day we just stop feeling so broken. We teach ourselves to focus our love and our energy in the broken places. We will them to be stronger, better. And after we are healed we are stronger. Stronger for having had the chance to focus our love and our energy. Stronger for having been broken. We move forward at first because we have to; life keeps moving. And then slowly over time we move forward because we want to. Because we are not afraid of it anymore. We stop looking at what is behind us. We learn that is does not matter anymore. We learn that we do not need it anymore; maybe we never did. We look ahead, forward. Because backwards is no longer an option. Because moving forward is better than standing still. Because moving forward gives us hope. Makes us strong. Sometimes things happen in our lives that throw us of course. Life can shake us to our core and sometimes scare the crap out of us. Those are all challenges. Challenges that only come our way because we are strong enough to overcome them. I know that I am stronger than I ever imagined I could be. I am stronger because I had to be. And learning to be strong also taught me how to be brave. How to endure. How to start over. When I feel like my life is getting bigger than me; I remember all that I have already overcome. And, I thank God for each and every single hard thing that stood in my way. Because all of those things came my way and I fought through them. I moved forward. I took the lessons that I needed from them; and I moved on. Sometimes we choose to be strong. And sometimes we are forced to be strong. And sometimes you may feel forced at first and then realize this is something you should have been choosing for yourself all along. Because life has a funny way of working out exactly the way it is supposed to. To the people in my life being asked to be stronger than they want to be right now; you can do this. Because you can do anything. You are surviving. You are growing. Learning. Pushing forward. You are already better; stronger. One day you will look back at this moment and you will be thankful that you did not let it define you. You will be THANKFUL for having been broken. You will be STRONGER for having been broken. You will be YOU for having been broken. There are a few things in our house that I have learned it is best to avoid during the hours that my children are awake. Sitting. I am not allowed to sit. If I do sit I become a magnet for naughtiness. “Quick, mom is sitting, let us pounce on her.” Attempting to have an adult conversation. Pointless. And by pointless I mean….IMPOSSIBLE. Using my phone. Because when you are a mom you do not get to have your phone. Because your children do not view your phone as your phone. It is a game; their game. And they will take it and do what they want with it. And, if I am being honest I think even my two-year-old is more knowledgeable on the functionality of Apple devices than I am. Fact. Yup, these are things we avoid. Why? Because it is just easier to avoid them than to deal with the consequences. So instead of sitting; we stand. We find ways to exist in the room with our children without being pounced on. And instead of having logical and thought provoking adult conversations; we argue with toddlers about things like juice and pillow forts. And instead of openly checking my phone for a voice mail (just kidding, I mean text message. No one leaves voice mails anymore); I hide my phone behind random things on top of shelves. And this generally leads to me losing my phone about 5-7 times a day. We do these things because we have become experts at the art of choosing our battles. Unfortunately, there are some parts of our routine that we cannot avoid; even the ones that are really really unpleasant. And, I am sure that my fellow autism parents out there can relate to this one…haircuts. There is nothing more terrible in our house than haircuts. Grayson, like many children with autism, hates to get his haircut. It is difficult for us to pin point exactly what he hates the most. He hates the sound of the scissors and buzzer. He hates the sensation of hair on his neck as it falls. He hates the feeling of the brush or scissors or buzzer on his head. He hates sitting still while being touched. Grayson did not always hate getting a haircut. When he was little he sat still(ish) and giggled during his haircuts. Around 15 months he was ready to graduate from simple trims at home to a full-blown hair cut at a salon. Unfortunately, around that same time we started to see a lot of Grayson’s symptoms. We took him to a salon for the haircut and it did not go well. He became very upset and restless. Eventually we left the salon and decided to try again another time. After 2 more unsuccessful visits we decided to stick to home haircuts for a while. During the next home haircut we were met with the same reaction. Eventually James and I were able to work together to keep Grayson safe from nicks and cuts while I not-so-masterfully cut his hair. It was a total chop job. But it was shorter and out of his face. And more importantly, it was over and would buy us a few months. It has continued like this over the past 2+ years. Some of the occasions are worse than others. Occasionally people will ask why we bother to cut his hair if he dislikes it so much. I think the simple answer is that he needs to learn about hygiene and routines and taking care of himself. And he needs to learn to be adaptable. We definitely let it grow longer than I would like it to be just to stretch out the time in between haircuts. We let it grow until it is in his face so much that it bothers him. And, at the end of the day, Grayson needs to learn that sometimes we have to do things we do not want to do. That is a part of life. Last week James and Rowan headed out to get their haircuts. I hung back to spend time with Gray. The whole time they were gone we talked about haircuts. About how all people get haircuts. I told him that when daddy and Rowan returned home they would have shorter hair. I told him how proud I was of daddy and Rowan. When James and Rowan returned home Grayson said “you got your hair cut?” He was interested in talking about it and understanding where they had been. Then the topic shifted to Grayson’s hair. To how proud I am of Grayson and how I knew he would be proud of himself after his haircut. He immediately shot the idea down. Ran to the other room. Eventually he came back into the room. I did what I normally do, I set the materials on the table so that he can see them and soak it in. We always start with the brush. He trusts the brush. He pulls my hand so that he can confirm that I am only holding a brush. And then I slowly reach for the scissors. And this is usually where we lose him. And this time was no different. His body changed as soon as I was holding the scissors. Except this time there was something different. This time he was calm enough to listen to our logic. We explained to him that we could take breaks and that if he held still mommy could go faster. It was not a perfect textbook haircut. But it went a million times better than any previous haircuts. We took 3 breaks; each time counting down from 10 cuts to zero before breaking. And when it was done he was proud of himself. He wanted to look in the mirror. And he was very excited to earn his big sucker prize. This experience, and many experiences lately, act as a reminder for us that sometimes we may be too close to things to see how much they are changing. We see Grayson every day. And a lot of the days are filled with challenging moments. When we see people we have not seen for a while we are always so appreciative of the positive feedback. Because at times we struggle to see the forward movement. Not because our expectations are too high, but because we are so wrapped up in the day-to-day. We are so close to it that sometimes it all looks the same to us. But when we take a step back and truly soak it in; the changes in our amazing spirited son are just too amazing to put to words. We crossed our one year anniversary with the Mercy Options program on June 8th. What an amazing milestone! I can hardly even remember where we were a year ago because so much has changed. Back then Grayson was primarily communicating in loud shrill screams. He could not sit for more than 60 seconds at a time to do an activity. He was unable to communicate with his family and his peers. It was a very lonely time; for Grayson and for our family. This past year has been a huge commitment and we made a lot of sacrifices to make this commitment. But when we take a step back and look at how far we have come in a year; we know that every single sacrifice was completely worth it. It is not perfect. There are still days that bring us to tears. There are still moments that make us question all of our decisions. But today is better than yesterday. And tomorrow will be better than today. And sure, some of the days will feel like setbacks. But if we have learned anything over the past 18 months it is this….parenthood is a marathon and not a sprint. Today was “zoo day” for the Sylfest family. Well, I should clarify. Most days in our house are kind of zoo-like, but today we actually traveled to the zoo! From the moment we first said the “z-word” this morning both boys started to bounce off of the walls. So we raced around the house packing up all of the necessities. Sunscreen, sweatshirts, diapers, undies, spare undies, shorts, spare shorts, juice cups, snacks, more snacks, hats, sunglasses, stroller…you know just the necessities. We set a goal to leave the house by 9:15am and worked diligently to make that happen. We set just enough timers for Grayson so that he would pee in the potty the minute before we would load into the car. We tag-teamed getting the kids dressed and getting ourselves dressed. When all was said and done we loaded into the car and set off for the zoo at 9:21am. Not too shabby. Any parent that sets out on an all-day adventure with a 4 year old and 2 year old expects that they will be returning home exhausted. And holy crap did we ever. Maybe it was the fact that we were out of practice just coming off of vacation. Maybe it was the fact that both kiddos insisted on walking all day; which meant a lot more chasing. Maybe it was all the time we spent talking up the zoo; planting so many ideas into their little heads about all of the amazing things they could do at the zoo. Maybe it was the fact that we are 32 and these days 32 just feels really really old. It was probably a little bit of all of these things. Oh, did I mention there were 4 adults and 2 kids? Cuz there were. The adults had the clear advantage, and yet as we walked out of the zoo gates 5 hours after starting our adventure all 4 adults were dragging their feet and the lunch-less (apparently there is not time to eat at the zoo; which is even more annoying because food is 3x as expensive), nap-less (cuz that would require sitting still and maybe even riding in the stroller we pushed around all day) toddlers were still running. I have been a little slow out of the gate after getting back from our adult-only vacation. But something happened at the zoo today and it got me thinking about our life. About our family. About the things that run through my mind every time we venture out. We had an amazing day. By all accounts the kids were troopers. They walked their short little legs all over the zoo. They were polite (kind of) and waited their turns (sort of) and they listened (ish) when we asked them to stop or wait. They were overcome with a big grin of excitement every time we approached a new animal exhibit. They were truly joyful. And seeing them that way made our hearts so happy. But amongst all of these moments of happiness there are also moments of worry. We know that we cannot stay home and live our life inside of a bubble, so we venture out and we hope for the best. Sometimes Grayson hits for no reason. Sometimes loud noises scare him. Sometimes he lashes out on his brother when he is told “no”. And sometimes he finds himself in a situation that makes him nervous or scared and in that moment he does not have the language to communicate his need. All of these things happened today. But the last was (and always is) the toughest to watch as a parent. The zoo has a fantastic play area. And in the “’big kids” part there are 2 series of jungle gyms. And to go to the very tip top you have to climb a small ladder through one narrow hole. It is only large enough for one kid at a time. And, once you get to the very top then the only way down is through one of 2 very tall winding covered slides. Now, Grayson does not do covered slides. I am not sure exactly why. But, he never has. He loves open slides. So upon making his way up to the very top of the 1st side of the jungle gyms you could see his body overcome with the realization that his only options to come back down were through one of the scary covered slides or the ladder. For a moment he forgot about the choice and just enjoyed being up so high. He could see that the other kids were having fun. He stood next to them and jumped up and down in excitement as they made their way into the slides. He was laughing and smiling. And from the bottom I tried to verbally coax him to try the slide. But my words made him feel more uneasy and he grew frustrated. Eventually he determined that the only way down was back through the ladder. Unfortunately, there was a never ending stream of kids coming up. Grayson would dip his foot down towards the ladder and would quickly pull it back up as another kid popped out of the hole. He was growing more and more frustrated. So, I walked as close as I could get and made eye contact with a bigger kid. I told the kid that my son was up top and he was afraid and he needed help to come back down the ladder. And that nice little kid told the other kids to stop climbing and they let Grayson slowly work his way back down. Now, because Grayson is 4, you will never guess what he did next? He ran immediately over to the other side of the playground and went all the way up the ladder to the tippy top…again. This side was even higher, so he could not even hear my voice from up high. I realized that the kids at the bottom of the ladder were much higher too. So I spent the next few minutes feeling anxious about how to help Grayson when he was ready to come down. He was oblivious; up there in the tippy top jumping up and down as kids zoomed down the slides. He was having a blast. And then he was done and ready to come down. This time he was a bit, shall we say “bolder” in his approach. He started jabbing his fit forcefully down into the hole to clear the ladder. There was a man at the base of the ladder waiting to help his son. I saw the anger wash over his face, “who the hell is this little brat and why is he kicking these kids.” Crap. I politely yelled “man in the white shirt” (I know, clever). After a few more times the man looked over at me and I said “I am very sorry, my son does not know how to communicate that he needs to come down. Will you please help him down?” I do not know if it was the mother’s plea or the look of concern on my face, but the man’s expression immediately softened. He helped Grayson down. And when Grayson got to the bottom he said “thank you man.” I ran over to Grayson and quickly pointed out a completely different part of the part of the playground. Two times was enough for the momma. As I walked away from the park I was happy that it was over. And I knew that in the grand scheme of the day it was a very minor incident. But it went to the core of our struggles. Our struggle for Grayson to find his voice. To communicate. To be understood. The last thing I want is to walk around everywhere we go playing the “A-Card”. That life is not the life for us. But sometimes without using the card people write Grayson off as rude or disobedient. Sometimes understanding that he has autism helps people to turn off their judgment and turn on their helpful understanding. And sometimes the helpful understanding can make such a big difference in the way our day plays out. Days like today help remind me of why I am doing this. Why I am writing our story. To give a voice to parents like James and I who are struggling to walk the line between needing support and not wanting special treatment. At the end of the day what we really want is to live in a world that is more tolerant of people. Not people with autism; all people. Today I needed help and I made a connection with a young boy and a grown man. Both of which I had never met before. Both of which had no reason to help me. But they did. And so I remind you that we do not always know the “full story”. Sometimes we only see a small piece of something that is really much bigger. And so in that small piece, remember that you can choose to judge or help. And, if you do not know how to help, just know by not judging you are already being incredibly helpful!